For the second time in about a year, Twitter’s algorithms have accused me of being a twitterbot, making automatic posts, rather than being a human interacting on social media, which I am (though I haven’t actually confirmed that fact with a DNA test). When this happens, Twitter either freezes your account, and makes you prove your human bona fides, or it begins to selectively prevent your tweets from going out to the world, with the message “something seems to have gone wrong” (or words to that effect). Twitter is rather coy about the whole thing, being reluctant to just tell you just what the problem is. Presumably, that is to prevent a “smart AI” from figuring out a workaround on its own. Of course, as AI becomes more I (intelligent), it will be harder and harder for Twitter’s algorithms to know that they are dealing with an A (artificial). So, an escalating war of the bots seems to be in our future. Let’s hope that our future dystopian AI fights remain in the, basically trivial, social media battlespace. Granted, it doesn’t make for very interesting SF, but it still can be mildly annoying to us humans. The reason that this happened to me, was my erstwhile practice of tweeting links to my Dodecahedron Books blog (i.e. this blog), usually between about 5 and 20 per day, equally split between morning and evening. I chose which blogs to feature via a random number generator, in an Excel spreadsheet, which held the tweet message, links, and hashtags. Those were then copied and pasted to Twitter, and the appropriate image was selected manually. This only took a few minutes per day, so it was hardly onerous, though certainly boring. It helped to listen to a podcast while doing so – I favored “The History of Philosophy Without and Gaps”. Lots of good content there. That being said, I also responded to people that I follow, sometimes visiting their links, retweeting, liking and so forth. Those tweets tended to be astrophysics or data science related, though books and general interest posts also sometimes caught my attention. So, I was not entirely a human twitterbot. I admit that my behaviour would seem rather AI-like to an algorithm that is designed to hunt out and eliminate bots. But social media is a funny thing – companies want to encourage the maximum amount of engagement and user interaction, but they also want to ensure that said engagement and interaction is “organic”. So, on the one hand they want to hunt down and eliminate bots, for the sake of credibility. On the other hand, being too diligent on the bot hunt could drive away legitimate users, such as myself, thus reducing legitimate user levels. And since user subscriptions and activity are the metrics by which social media are largely judged, in terms of stock market evaluations and advertising fees, they can’t afford to lose legitimate users. It is a classic Type 1 vs Type 2 error situation in statistical theory. You want to accurately identify true positives (real users), true negatives (twitterbots), false positives (twitterbots that seem human) and false negatives (humans that seem like twitterbots). Ideally, you want to keep the real humans and eliminate the twitterbots, but that’s not always easy to do. You have to consider the cost of keeping too many twitterbots (reputational damage), versus eliminating too many real humans (dropping user count and alienating people). As for those of us real humans who get swept up by the twitterbot hunt, what should we do? Twitter doesn’t make it easy - they don’t actually let you know what their limits are, in terms of using Twitter to push your blog or product. Sure, there is some hand-waving about their terms of service, but those tend to be frustratingly vague in these matters. So, it is hard to modify your behavior to meet norms that are not explicitly stated. I have to admit, it is kind of liberating to be relieved of the Twitter workload, via Twitter’s overly diligent twitterbot seeking algorithms. But, there is that nagging need for validation of one’s efforts, and in today’s world social media is a powerful force in that area, for good and bad. For now, I will just say that it is something that we just have to muddle along with, as best we can. And if the effort to “stay social” becomes more trouble and anxiety-inducing than it is worth, seriously consider at least taking a break from the activity. 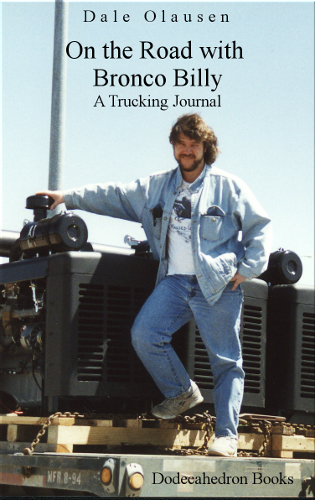 Meanwhile, consider buying and reading “On the Road with Bronco Billy – A Trucking Journal”. It’s only 99 cents, and it’s a trip that won’t let you down, or accuse you of being a robot. What follows is an account of a ten day journey through western North America during a working trip, delivering lumber from Edmonton Alberta to Dallas Texas, and returning with oilfield equipment. The writer had the opportunity to accompany a friend who is a professional truck driver, which he eagerly accepted. He works as a statistician for the University of Alberta, and is therefore is generally confined to desk, chair, and computer. The chance to see the world from the cab of a truck, and be immersed in the truck driving culture was intriguing. In early May 1997 they hit the road. Some time has passed since this journal was written and many things have changed since the late 1990’s. That renders the journey as not just a geographical one, but also a historical account, which I think only increases its interest. We were fortunate to have an eventful trip - a mechanical breakdown, a near miss from a tornado, and a large-scale flood were among these events. But even without these turns of fate, the drama of the landscape, the close-up view of the trucking lifestyle, and the opportunity to observe the cultural habits of a wide swath of western North America would have been sufficient to fill up an interesting journal. The travelogue is about 20,000 words, about 60 to 90 minutes of reading, at typical reading speeds.